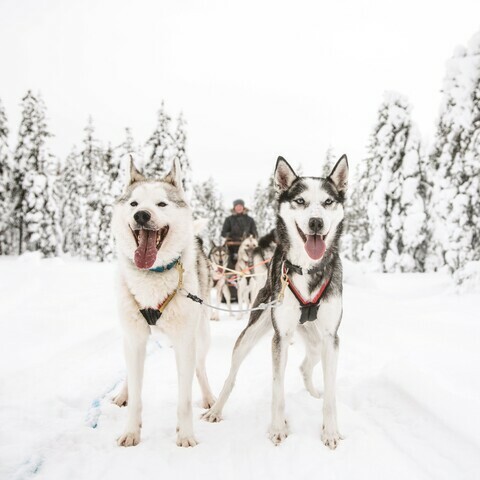 Visit our home and drive your own dog sled. 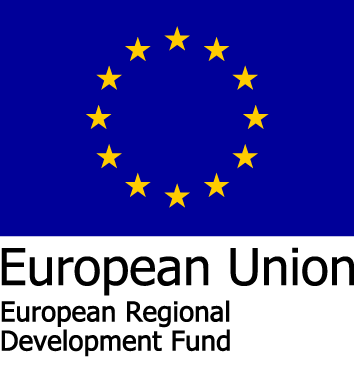 This is really nice experience for the individuals and families with small children. We have huskies and a cat. Join us and feel part of the team. 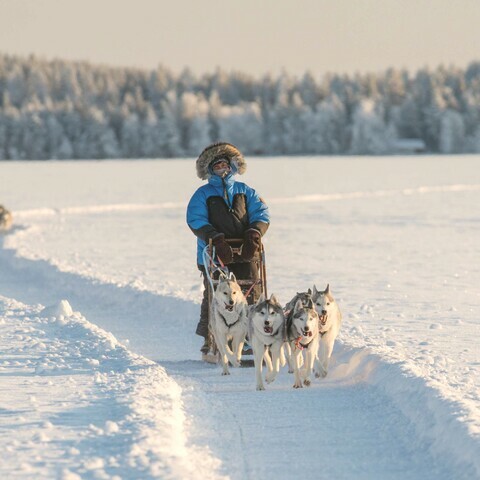 You will learn how to drive the sled and the children can sit in the sled in the warmth of the winter sleeping bag. We cross easy terrain, over the frozen lake. We will have a little break to drink hot juice and hug and play with the huskies. When we come back to our house, we will make a delicious pancakesin the warm of the house or by the campfire for a picnic depending on weather. And there is time just to relax and hug huskies. 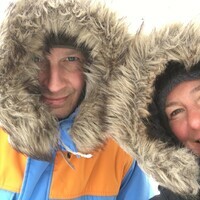 Aksana and Antti adventurous couple has worked in the great outdoors for 20 years. They have filmed their trips, written hundreds of articles, and based on their outdoor experience they have been involved in the product development of outdoor supplies. brand Kurola Photography, making it possible to express his artistic impressions of the beauty of nature. 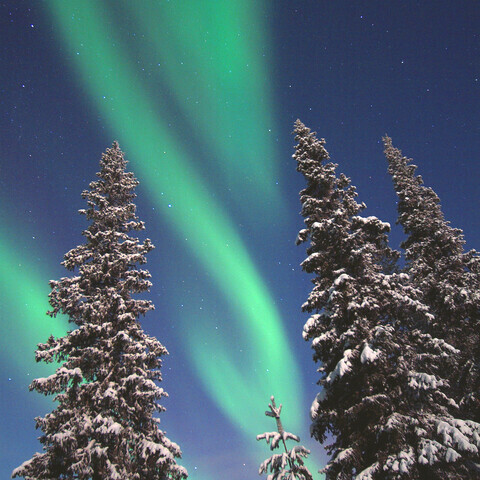 Antti’s images have been used to decorate a number of hotels and he has held a number of photography exhibitions. The Finnish Post Office has also used his pictures for its stamps. Antti has a photography gallery at his work premises. 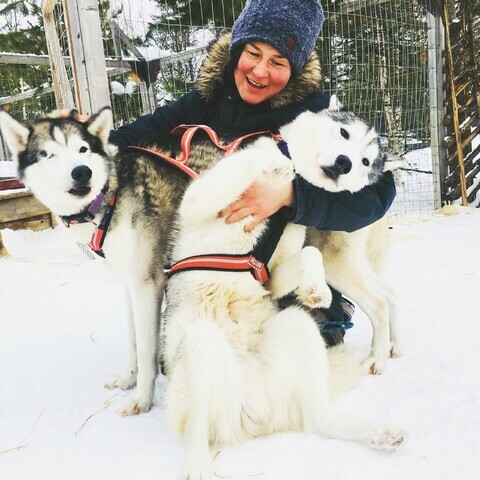 Aksana organises yoga trekking and retreats all over Lapland and at her home in Sierijärvi, Tuulenpesä Husky Home. Nature provides content for Aksana’s tales, the treks she organises, yoga practice and training sessions. 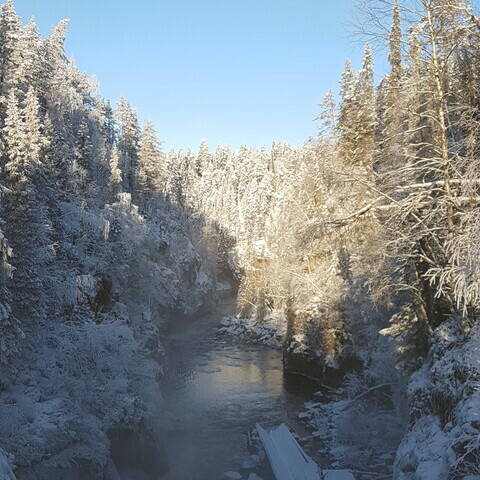 Nature with its fantastic diversity, delicious wild food made from natural produce, yoga, meditation, ease of breathing, yoga treks, husky sled rides, and meeting lovely people are the things they love most about their work. Aksana’s own yoga experiences started back in 1991 and she has worked as a full-time yoga teacher for around five years. Her special focus is on yoga therapy. Perhaps the greatest and most significant learning processes for Aksana have been obtained from spending long times alone in the wilderness. The wilderness facilitates a deepening of life’s levels: to feel, comprehend and internalise. “The most important and intrinsic learning I have received is listening to my own heart. Time needs to be reserved for taking a moment to stop and feel the strength of presence and internal wisdom. 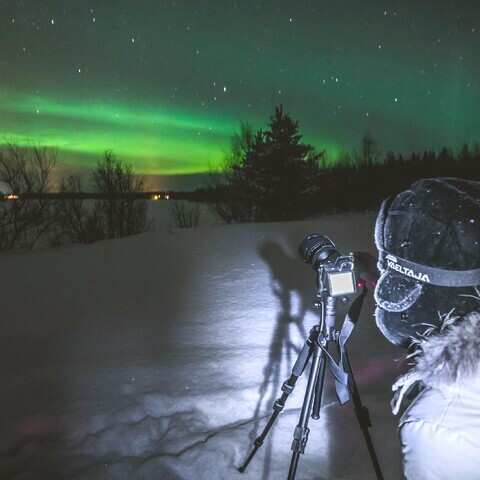 We hope that our paths will one day cross and we can head towards a balanced, prosperous life, and the life that suits you best – or perhaps experience an unforgettable moment on your trip to Lapland. The fantastic experiences we feel are important and unique are precisely what we want to share with others. We have warm winter anoraks, gloves and hats. You need to have good winter shoes. It was amazing. We’d like to thank you for a beautiful tour with the Huskies. They are so kind. A great Huskies-tour, About ca 25 km on the frozen lake and the forecast as well to. Even the BBQ was super. A wild-outdoor fire with sausage and mustard with berry-juice and a tee. So after we could play and cuddling with 16-17 dogs. So good luck for the future and we wish you al the best. Hope sometimes to come back. Aksana Thank you Adella! So we did 25km tour and it went great! I wish all the best for you!!! They are wonderful. The husky ride is amazing and the family is fantastic and very kindly. We wanted to take a husky sleigh ride, but didn’t want to pay too much for a touristic 20 minute ride. So this was exactly what we wanted. It was just Antti and the two of us. This Trip was everything we hoped it to be. First we were picked up at our apartment and took the short ride to their home. We got some warm clothes from them and went to meet the dogs. Antti then prepared the sleds and we began our two hour ride. With a short break for a tea in the middle we had the best time ever. The dogs enjoyed it as well. They didn’t like the break though. Back home the dogs were fed, we drank a coffee and Antti drove us to the reindeer farm next door. Aksana and Antti are great, very very friendly almost as friendly as the huskies ;-) they told us how to ride the huskies and were next to us all the time looking after us. Small brake half way down to let huskies and us rest and we were offered a nice hot drink! Its great to deal with people like them, you feel the warm of small family business instead of dealing with big companies were you are just one more number. Thanks again Huskies, Aksana and Antti for a lovely experience! I hope we could back again sometime!!! Highlight of our trip to Lapland! 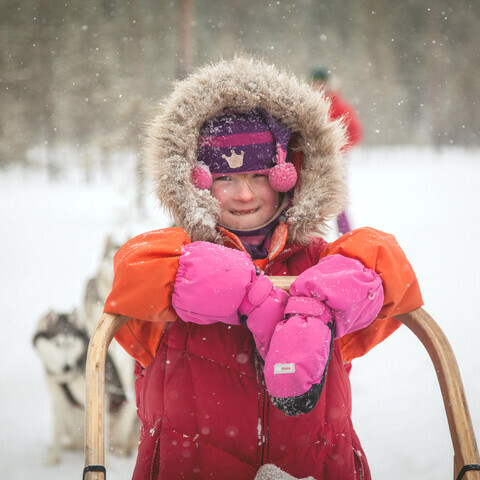 We had such an amazing time in Lapland and our visit to Aksana and Antti was just the icing on the cake. It was such an wonderful and unique experience and certainly not something you'd not get from a large tour company. Their house and hospitality was second to none and it gives you a lovely insight into Lappish culture. I never expected to be guiding the dog sleigh but it was so much fun across a frozen lake and the scenery was magnificent. Afterwards we were treated to delicious food inside their beautiful home. We will return! A party of 6, including 2 girls aged 8. We had a brilliant time! Aksana and her husband were so welcoming. Definitely worth doing - fabulous memories! Aksana and her husband were really very very nice with us, we absolutely felt like in family with them. It was my partner birthday and they remembered about it, we were offered a delightful cake and tea and postal pictures. We spent half day with them. each of us drove our own sled. They always ensured about our safety, they freely loaned us warm clothes, activity was absolutely magical, under shy sun of January, at the sun rise. Easy access to get to the farm, we went there with our own standard car. It is not touristic attraction at all, it is a real experience and human share. If you want to experience sledding, don't worry and go ahead, they are obviously the family you need! 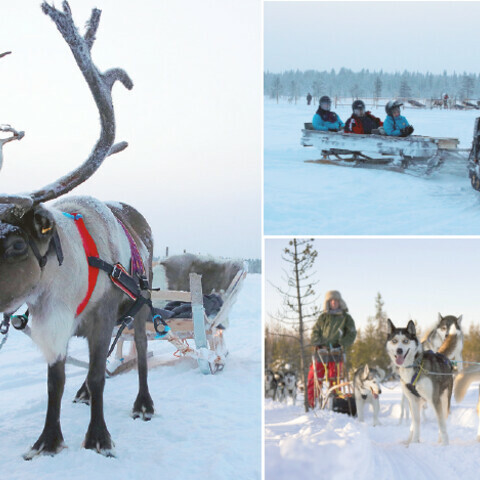 We booked a private trip with the huskies for ourselves and our 5 and 6 year olds. 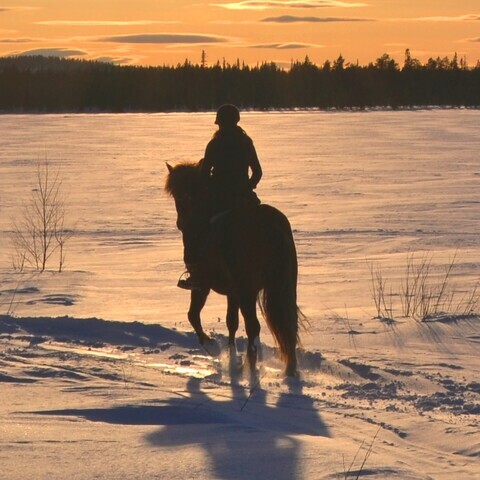 We were picked up at our hotel by Aksana and driven to their home and husky farm next to a stunning frozen lake surrounded by snow covered trees. 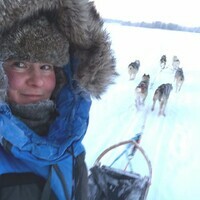 There were 8 huskies (4 per sleigh) and we were shown how to drive the sleighs, with children wrapped up warm inside. Antti and Aksana came with us on their snowmobile and made sure we were OK on several occasions during the hour and we covered around 8kms on the lake. The place was magical and it was a great experience. Part way round, we had some warming hot berry tea. 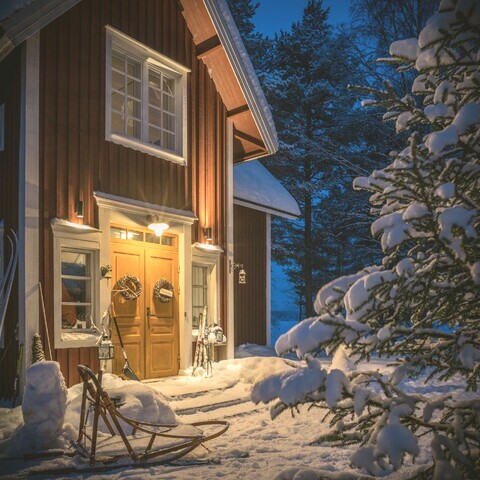 Once back at the house, the children had a chance to cuddle the huskies and cat and we were offered hot drinks and crisps with homemade salmon dip followed with delicious homemade Finnish pancakes and jams. This was such a wonderful way to see the area and a great way for the children to meet the animals. We would definitely recommend this. This was even better than our dog-sledding experience in Yukon and in the Swiss Alps. We had even more fun this time! Thanks Aksana for making our dreams come true and taking care of us at your own home! Looking forward to come back soon. We had an amazing time. Very nice couple who gave us a real local experience riding the huskies. We also had a very nice stop for a short picnic. Highly recommend this! Aksana and her husband were very welcoming and tried their best to meet our schedule and requirements. The track is well marked, secluded and fun to ride around. 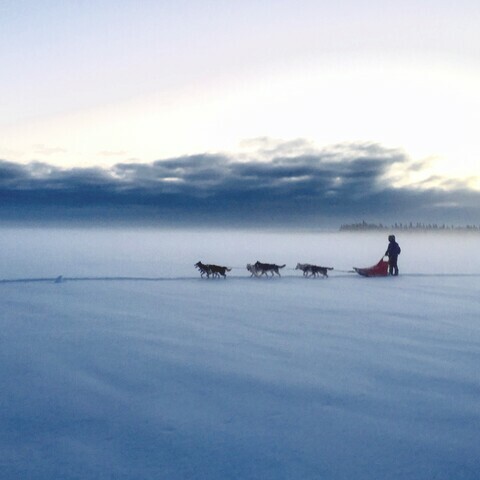 They follow along on a snowmobile to ensure safety of the mushing teams. Dogs are very friendly and beautiful. We really enjoyed that the group was small (only the three of us) and everything felt friendly and well thought out. Thanks guys, we had a blast!